I’m convinced there’s absolutely no better way to enjoy corn than this. Perhaps it’s the combination of culture, memories, and large doses of nostalgia. After all, this is my mom’s special grilled corn recipe. We ate it while grilling the first time I ever swam at a “beach” as a kid (yes, it was just a lake beach in the land-locked Midwest, but I absolutely loved it). Whenever my mom visited Boston (back when we didn’t have a grill), she would make this at my sister’s place, which has multiple grills. Every single time, it was fantastic and we could never get enough of it. 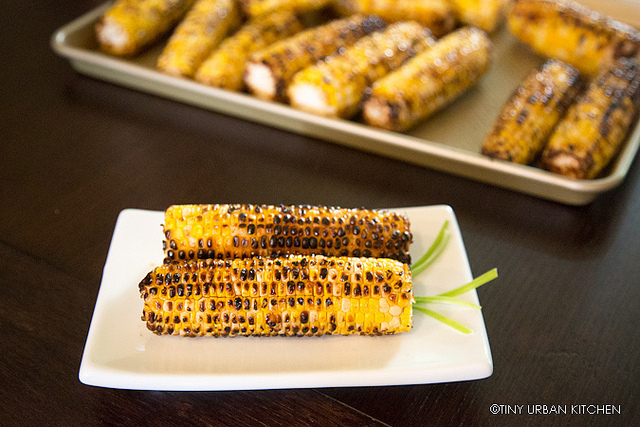 This Taiwanese-style of grilled corn is really, really tasty. Imagine – sweet, charred, almost caramelized corn with hints of garlic, soy, and sweet chili sauce. In Taiwan, you’ll most often see this type of grilled corn served at night markets, although it appears in traditional outdoor markets as well. I called my mom this past weekend in a moment of desperation when trying to figure out what to make for my relatives who were coming over for dinner. My mom saved the day. And I was floored how simple this recipe was. There are just three ingredients in this magical sauce. Soy paste, which is a thick form of soy sauce, sweet chili sauce (tian la jiang), and lots of garlic. If you want to make it spicier, you can add some sort of chili oil or chili sauce. You know how Asian moms are – there’s no such thing as measurements. Turns out it’s roughly 4:1 – with soy paste being the main ingredient. I’m glad I asked! I was totally considering trying a 1:1 ratio . . . Mix together the sauces with lots of fresh, smashed garlic. I think the amount of garlic you add is largely personal. I can’t see you going wrong either way. I chose to add about 4-5 cloves, and I smashed them up real good to try to extract as much “garlic juice” as possible. Stir everything together and set aside. It’s nice to let the flavors meld a bit while you grill. And then start grilling the corn! We don’t do any of those fancy tricks to try to keep the corn moist. We just throw the cobs (shucked) straight on the hot grill. Rotate it every few minutes so that it can char as evenly as possible. After about 15-20 minutes, when the corn is just starting to char, start brushing it with the sauce. Do this over and over again, rotating the corn every few minutes and reapplying the sauce. Pretty soon, the corn will be gorgeously charred and will have absorbed much of the flavorful sauce. If you coat the corn cob 2-3 times with sauce, you’ll end up with a lighter tasting cob. Slather it 5-6 times, and the flavor will be more intense (more preferred, in my opinion, but minds may differ). In Taiwan, they finish the whole cob off by slathering lard all over it before serving. You can do the same with butter or oil. Or, if you’re like my mom, you just skip that step entirely. Frankly, it’s pretty tasty either way. Mix together soy paste, sweet chili sauce, and smashed garlic cloves. Set aside. Grill corn on a hot grill until the corn begins to char, about 20 minutes. Brush on the marinade and turn the corn, repeating this 3-4 times, or according to your preference for intensity of flavor. I’ve never heard of soy paste (and I’m Chinese and in my fifties)! I can hardly wait to try this recipe. Yummy! So glad I found your blog this past year… really enjoying it! Oh goodness – this corn sounds perfect for my next cookout! Thanks! I think some people might call it Thick Soy Sauce – not sure if Soy Paste is its only English translation! This looks amazing! Love the picture at the end, too. I’m a big fan of grilled corn on the cob and am always looking for new recipes. Thanks for sharing!! Great Post, been working on a play of the roasted corn with sacha sauce we had in Taiwan and so far I’m liking the results. These beautiful grilled corn just reminds me of the good old days. Whether you are in Africa Asia or America, it feels good to grab one of these specials to make your day special. I made this yesterday and had some leftover basting sauce so I’m eating it right now over silken tofu. SOOOOOOOOOOO GOOD! I would love to try your sacha version! After living in Texas for 27 years, I suddenly wanted to eat this corn. Ran to the market and got the corn. Will BBQ tonight. For sure will bring back good old memories of eatting this corn in Taipei so many years ago. I have a question, does the corn have to be pre-cooked or can you throw it on the grill raw? Excellent question, and great timing! I just tried it last night pre-cooking, and I think it works even better. I just threw the corn (with husks still on but “hair” cut off) into the microwave and “steamed” them (about 3 minutes per ear), and then grilled them. It took a lot less time to grill and the corn was much juicier. It still works fine the other way, but takes a lot longer and the corn turns out a bit drier on the grill. Enjoy! Hope you liked it! I just made it last night again! Thanks! We’re going to try it pre-cooked then. I tried your recipe last night and it was great. My corn had a much thicker glaze of the sauce that yours appears to in your pictures. Do you just put a thin layer on your corn or is my soy paste thicker? I have been adding a bit of water more recently to lighten up the sauce. Maybe I should update the recipe to mention that . . . I always see this on the streets of Taipei where I live, but thanks for sharing how to actually make it!! I tried it out but I think “soy paste” is a very misleading term. I asked for one in the store and they gave me a “soy bean paste” which seems not to be the right thing. At the end it tasted VERY sour and def. not suitable for corn.